Baz Luhrmann’s The Great Gatsby has one truly spectacular shot. It comes after what feels like an hour — an hour of spinning and zooming and whooshing, of minced imagery, of Tobey Maguire talking and talking and talking, of a 1922 that keeps whispering the songs of 2000-something (Alicia Keys’s voice wails New Yoooooooork as a car crosses a bridge), of relentless audiovisual sugar. As for the shot, it’s just a close-up of Jay Gatsby. But the movie has so gossiped about his parties, his travels, his riches, his essence, his bogusness that you just want to see for yourself what’s got everybody so breathless. You want to lose your breath, too. So when Luhrmann finally put a face to the fanaticism and produced Leonardo DiCaprio’s, I reached for an inhaler. DiCaprio’s mouth is etched, equidistant, between a smile and a smirk, his blond hair frozen and fixed into amber waves, his skin as pink and orange as grapefruit meat. This is why you go to the movies — for a sight you’ve never seen even though you’ve seen it a hundred times. That’s DiCaprio for a lot of this movie: somehow new. You wonder how many weeks it took for him and Luhrmann and the crew to determine the math and chemistry of that smile. It’s a moment that conjures up visions of blueprints and charts and controls. Yet for as much calculation as there is in that introduction to Gatsby, there’s also a quality that’s simply beyond science: stardom. DiCaprio’s chronically boyish demeanor has denied his screen self both true handsomeness and actual carnality. His steady attraction to nutcases, weirdos, and loose cannons has desensitized us to what a good psychological actor he is. That roundness of his face also tends to lessen the impact of his talent. He’s still too cute to be taken seriously. But he’s never been more beautiful than he is here. 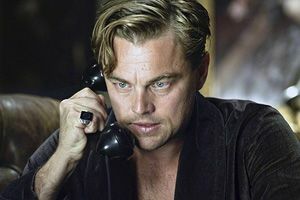 Unlike other men who’ve played Jay Gatsby — in particular, the more mannishly beautiful Robert Redford in the comatose 1974 version of F. Scott Fitzgerald’s novel — DiCaprio’s Gatsby is a gorgeous neurotic, always slightly nervous that his ritzy mask will slip enough for the rags and insecurities to show, so he simply keeps talking. But the nervous undercurrent DiCaprio gives the character doesn’t feel like boasting. It’s self-perpetuation. This Gatsby is gossiping, too. All this talking aims to get the attention and sympathy of a Wall Street drone named Nick Carraway (Maguire), who lives in a Long Island cottage next door to Gatsby’s amusement park of an estate. The book and film are narrated from Nick’s point of view, though Luhrmann invents a tranquil asylum for a depressed Nick to write down his memories for his doctor (Jack Thompson). It’s a lazy screenwriting device that allows Nick to remember his neighbor the way Charles Foster Kane remembered Rosebud. Gatsby wants Nick to facilitate a reunion for Gatsby and Nick’s cousin Daisy (Carey Mulligan). They were lovers when he was a penniless soldier stationed near her Kentucky home. Five years later he’s returned from World War I and other adventures, filthy rich and ready to see her. But Daisy is listlessly strung out on the riches of her bullish husband, Tom Buchanan (Joel Edgerton), who happens to have been a classmate of Nick’s and is having an affair with the wife (Isla Fisher) of a mechanic (Jason Clarke) in a low-rent district Fitzgerald called the Valley of Ashes. The central romantic question is whether Daisy will leave Tom for Gatsby. The revelation of the answer is as grandiose as it is in the book. Luhrmann clearly cherishes Fitzgerald’s sense of luridness. The novel builds to a titillating succession of deaths. But the problem with the book — one of them, anyway — is that is has no sense of tragedy. The rich and poor suffer at each other’s hands. And at the center of it all is a love story between a diffident woman and a passive-aggressive man. They’re ultimately figments to each other. Maybe that’s the tragedy, that all this work and striving on Gatsby’s part is really for nothing. Otherwise it’s pulp with a fancy zip code, noir straining for Theodore Dreiser. And yet it’s an exciting book to read for its salacious window into moneyed people, for how it sees the rich as savage, too. Luhrmann tries to get at that sense of ravishment. 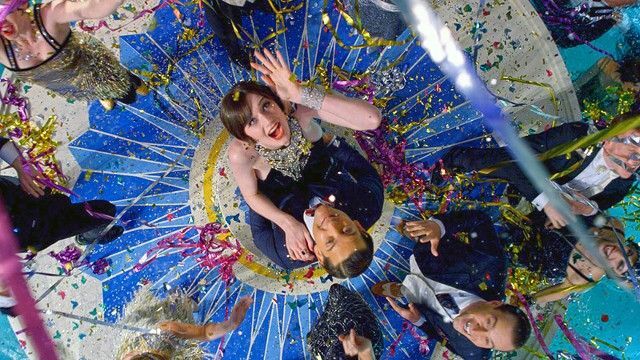 Before Gatsby arrives, and well after he’s established himself, most of the shots in the movie come at you in a fire-hose rush: faces, sequins, hair, asses, confetti, liquor, cars, billboards, an anguished body flying through the night. The movie has such an overcranked energy that it has to stop to catch up with itself. But all that motoring around sometimes makes sense, like when Gatsby takes Nick for a ride in his yellow roadster, regaling him with his version of the story of his life. He’s talking and driving so fast that his words have practically blown away behind them before Nick can make sense of what Gatsby’s saying. For Gatsby, Luhrmann has discovered 3-D, and so the entire film is presented that way. But it’s redundant flavoring, optical MSG. During one of the movie’s climaxes (Luhrmann is nothing if not a multi-orgasmic director), in a humid room at the Plaza Hotel, Luhrmann shows you how those plastic glasses can help heighten the emotional intensity of an argument. Gatsby also permits Luhrmann to see what he can do with the novel’s Jazz Age setting. The film’s opening image is a series of old-timey black-and-white logos that achieve astonishing Art Deco crispness. You can feel him straining to modernize the book. He told Charles McGrath in a profile for the New York Times that he wanted to give the audience a sense of how thrilling it would have been to hear jazz in 1922. To that end, he employed the services of Jay-Z as a music supervisor — or “Shawn ‘Jay Z’ Carter,” says his onscreen credit — and there are licks or two from nowish hits; things like songs from Watch the Throne and Beyoncé covering Amy Winehouse’s “Back to Black.” While Tom and Nick party with Fisher’s Myrtle and her friends in the valley, there are cutaways to a young black dude in sunglasses playing a trumpet on a fire escape across the way. It’s fair to wonder if we’re still in a movie or an ad for Disaronno liqueur. Luhrmann seems uncharacteristically confused about how to use this music. He’s hardly a cynical filmmaker, but Jay-Z’s participation feels like street-cred opportunism. Romeo + Juliet and Moulin Rouge! were both shrewd about the power of music. The songs had centerpieces and some relationship to the narrative, so that the result was simultaneously Broadway, La Scala, and MTV. There’s so much narration in The Great Gatsby that it’s obvious the novel is meant to be the soundtrack, but Maguire isn’t much of a singer. And after DiCaprio, the rest of the casting feels slightly off. If DiCaprio is stubbornly boyish, Maguire is still being taken to day care. He’s reliable as Nick, but if you’ve seen him in Brothers you know he can be so much more. His Nick is an incorruptible point of entry, but what you notice about him is how much smaller and slighter he is than everyone else, especially Elizabeth Debicki, the very long Australian who plays Jordan Baker, Daisy’s rumormongering best friend. Luhrmann doesn’t bother with the affair Fitzgerald wrote for these two. He might have known it wouldn’t play visually. Debicki makes a sport out of sitting around while Edgerton — wearing a silent-movie mustache — bellows and grunts and brays, and a chicly blonde and bobbed Mulligan sighs, pants, and flutters. Edgerton acts with a brutishness that he should be ashamed of, but he just wears you down with machismo. By the time the movie’s over, he has covered you in it. Mulligan mopes like a great European star. Her face is as long as the Champs-Élysées. Every time you think her glamorized solemnity is all wrong for Daisy, she’ll pump a lot of air into her voice and lift her line to ditzy heights. She’s got the character’s melancholy (I suspect that’s easier for her to play), but not enough of the addled giddiness. Mulligan needs her own movie as soon as possible. Casting her here is more obvious than inspired. She’s always somebody’s Daisy. But the casting gets at how off-kilter and sloshing this movie is. DiCaprio and Maguire are the only Americans in major roles — the Bollywood legend Amitabh Bachchan plays Gatsby’s Jewish gangster friend Meyer Wolfsheim — and the accents have no consistent sense of place. Or maybe it’s the wrong sense of place. At various points, the movie looks and sounds as if it’s one drink and 10 degrees away from collapsing into Tennessee Williams despair. But this Gatsby doesn’t have the psychology for that. More than anything, that lack of depth is Luhrmann’s trouble as director. After a while, you expect a bit of perception or some wisdom to creep into the coked-up energy of his filmmaking. That’s why Australia was so ravishing but politically and morally vacuous. I imagine one reason, aside from the scale of these productions, that he shoots so infrequently — this is his fifth movie in 21 years — is that he wants to maintain his capacity for awe. But material this familiar needs an angle sharper than 3-D. Having reverence for Fitzgerald’s novel isn’t the same as having a grip on it. For one thing, the movie doesn’t gather as it goes. This is Luhrmann, though. He has no sense of proportion. He thinks every shot, every microcut, is significant. At some point you stop trusting his sense of the dramatic. It’s all drama to him, and no one has that kind of stamina. And yet for all the antic, manic itchiness of his Gatsby, for all the jazz hands, the movie doesn’t reach out and grab you. Luhrmann’s not interpreting the book — or he’s not interpreting it far enough. There are interesting interpretations that span the gamut of quality. There’s the all-black Gatsby (2002’s risible G) and the shockingly seductive 2010 stage production (Gatz) that grows out of one man reading the entire novel aloud at work. Luhrmann’s movie has a noble literalism. It appreciates the surfaces of Fitzgerald’s novel. The words appear typed on the screen and fall like snow or ash. (On top of everything else, it’s as if Luhrmann’s just learned to read, too.) You don’t feel the drunken drugginess that you see before you, and that’s not because this is a cautionary movie — Luhrmann’s Twitter handle would be @cautiontothewind. It’s because reverence has bogged him down. If Gatsby is on any drug, it’s diet coke.